This week, following on from my report of our experience of the ECF Championships, I wanted to write a little bit on what I observed about the equipment being used at the ECF Championships by the competitors for their dogs. The main thing I noticed was the amount of Zero DC and Non-Stop harnesses being used on the dogs. Not a big surprise I suppose, bearing in mind that both brands are designed and produced in the European continent (the Czech Republic (Zero DC) and Norway (Non-Stop)) and are readily available to the European canicrossers. The dogs in these harnesses had such free range of motion through their backs and all the power was transferred down the harness through the line, leaving the human at the end of that line to try and keep up! The other dominating harness was the x-back. There were various different brands and this was what I had expected to see, as for decades now x-backs have been the choice of harness for competitive ‘pulling’ dog sports because the design of an x-back is to effectively transfer power through the line and pull a full load over hundreds of miles. I think the x-backs will always be used in canicross, bikejor and scootering for this reason. Traditionally these harnesses have been sized for the sled dog breeds but it was clear to see the difference in the dogs’ anatomy and movement between a normal Husky and a ‘Eurohound’ (typically an Alaskan Husky crossed with a Pointer). I think the introduction of different dog breeds into the pulling sports has been the catalyst for the harness designers of Europe to produce something that will not only fit the different breeds better but also to cater for the differences in movement. I believe that because every dog is an individual, that each dog should be treated as such when fitting a harness and no one style will suit every breed. The new designs being produced in Europe enable me as a supplier to provide a wide choice for each dog and it was great to see the brands I sell on the podium time and time again. 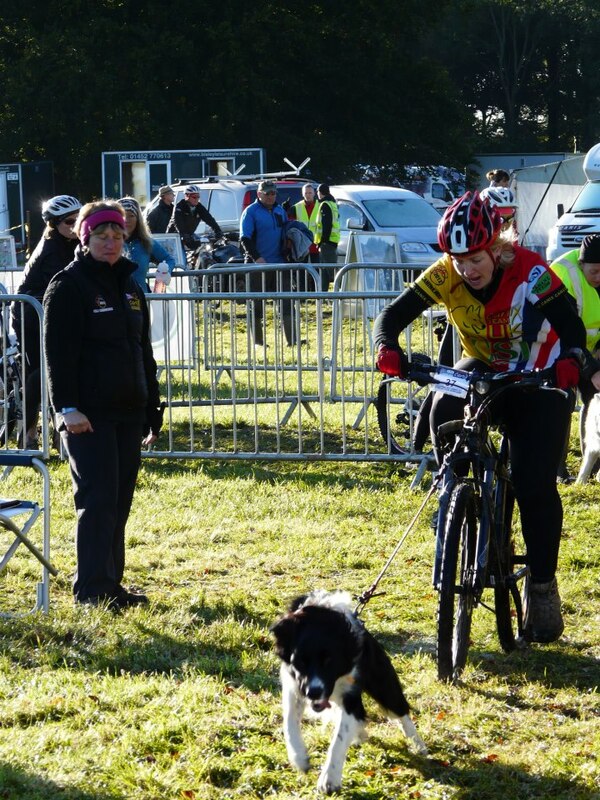 Well now that the 15th European Canicross Federation Championships is all over – was it worth it?! Hell yes! 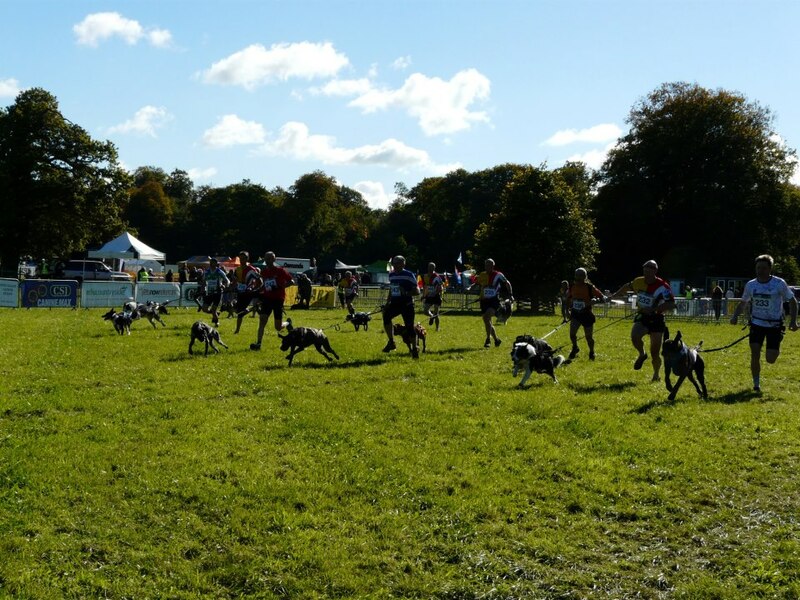 The atmosphere at the weekend was amazing, with teams from all across Europe competing against each other in the biggest canicross event the UK has ever seen. We arrived early Thursday to set up the K9 Trail Time stand ready for any competitors or visitors to the CanineMax Dog Olympics 2012 who might want to purchase some new kit. The rest of Thursday was spent sussing out the course and realising to my horror that my v-brake bike was not going to cut it in the very muddy conditions, due to the build up of vegetation preventing my wheels from moving. After about an hour of panicking, some very good friends who had just arrived from Scotland made an offer of a bike for me to borrow before they had even set up in the camping field. To them I owe the success of my 11th place European ranking, as without their bike I wouldn’t have made it round. Friday was the opening ceremony which saw the Championship opened with a representative from every country yielding a flag and entertainment provided in the form of a Welsh choir, Irish dancers, a Scottish bagpiper and an English Sea Shanty group. Saturday kicked off the racing with the mens individual starts for the bikejor class from 8am and we set off just after 9am for our attempt at glory. The course had dried out a bit from the day before but was still very slippery in places and we managed to get round the 5.6km in a respectable time, mainly due to the fantastic pulling power of Donnie the Sprollie who finished with bags of energy to spare and a big smile on his face – unlike me! Our second class of the day, the female canicross, started in the afternoon, just after midday and again saw individual starts for the competitors so we could be timed and then allocated a ‘wave’ for the following day. The course was run over a shorter distance than the bikejor, of approx 3.5 km. Judo did his best to pull his lump of a human around after him but the effects of my illness and the earlier bikejor class had taken their toll on me and we finished 29th in the field. On Saturday night we were provided more entertainment in the form of a banquet for competitors and a chance to catch up on how everyone was doing at the halfway stage of the competition. It was lovely to see so many people there sharing their experiences of the course and to find everyone so friendly, no matter what country they were representing. Sunday was individual starts again for all the bikejorers but this time in ranked order, so we were about mid way through the females in our age group, setting off just after 9 again. The course was in much better shape by Sunday morning and so we managed to knock a minute and a half off our Saturday time but still maintained 11th for a final placing and 4th out of the UK competitors. The mass starts for the canicross are always exciting and although we were lined up in the last ‘wave’, we got a good start ‘off the blocks’ and managed the 5.6km in a reasonable time, again holding on to our 29th place but I finished the last 200 metres with a sprint, spurred on by the cheering spectators. The prize giving ceremony, held in the evening, was the climax of the 2 days racing and the UK team did fantastically well taking home 4 gold medals, 6 silver and 8 bronze. Team Thomas were extremely proud to have been part of such a big and multi-national event and although our own personal results didn’t bring us medals, we still felt a massive sense of achievement just to be able to compete alongside some of the best in Europe. Next years ECF Championships are to be held in Switzerland and we’re already planning how to get there as this really was an event not to be missed! Team Thomas’ canine contingent is currently made up of three rescued collie crosses ranging in age and each of them is very individual. For a start they are all crossed with a different breed of dog which instantly sets them apart from each other and gives them distinctive qualities which are breed specific. For example, Donnie, the youngest is a ‘Sprollie’ Springer Spaniel cross collie and he is always darting around in the undergrowth sniffing out trouble as I’m sure many Springer owners can relate to. Judo, the ‘middle child’ is collie cross lurcher (we think) he has definite sight hound qualities and if he sees something to chase – is gone! Tegan, the oldest, is collie cross husky and therefore you’d think she would be the best placed in the team for the job of pulling in harness, being that huskies have for many hundreds of years been successfully used as sled dogs. However, when canicrossing, bikejoring or even scootering, Tegan is a dawdler. What I mean by this is that although she makes an effort to pull in certain situations i.e. on the start line of a canicross race or if she sees a squirrel/rabbit/deer dash out in front of us on a training run, ultimately she likes to trot along beside me or even behind me, taking her time and soaking up the environment around her. The two boys are 99.9% of the time in such a rush to get to wherever it is they think we’re going, that they often miss the passing wildlife and have been known to continue running in spite of the fact I am face down behind them and still attached! I’ve seen many people on dog sport forums asking the question ‘how do I get my dog to pull me better?’ and I can sympathise. If you are a quick runner there is nothing more frustrating than being held back by a dog who just wants to sniff and pootle along beside or behind you. I’m not a fast runner but I do know Tegan can put a lot more effort in than she does a lot of the time because I’ve seen her shift herself very quickly indeed if you rustle a cheese packet! 1. Give them something to chase – another dog or person in front can encourage a dog to speed up. If something interesting is in front, then 9 times out of 10 you can expect your dog to want to follow it and increase its’ speed to do so. 2. Make the routes you run interesting – don’t just follow the same route day after day, not only is it boring for your dog but your dog may well want to stop to mark its’ territory if the route becomes familiar and they begin to adopt it as an extension of its’ own space. Don’t run on wide open fields where your dog has the opportunity to get bored or not know where it’s supposed to run. By running on single track paths through woodland, your dog will find it easier to follow the trail and dogs often prefer this type of running. 3. Connected to this is what surface you are running on. If you’re running on hard surfaces that are uncomfortable for your dog then you might need to re-assess your run routes to incorporate more grassy trails that are nicer for your dogs paws. Dogs tend to prefer lovely grassy trails over the harder packed trails but if your dog isn’t pulling, avoid large open fields with no clear pathway. 4. Talk to your dog – you might look silly to everyone else but by raising the pitch of your voice, your energy is given a lift too and by increasing your own energy, you can encourage your dog to do the same. 5. 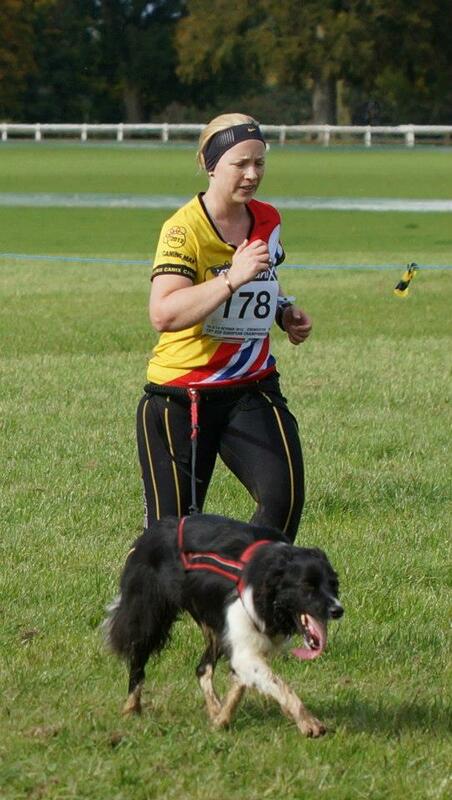 Keep your distances short until your dog is keen to run further again. 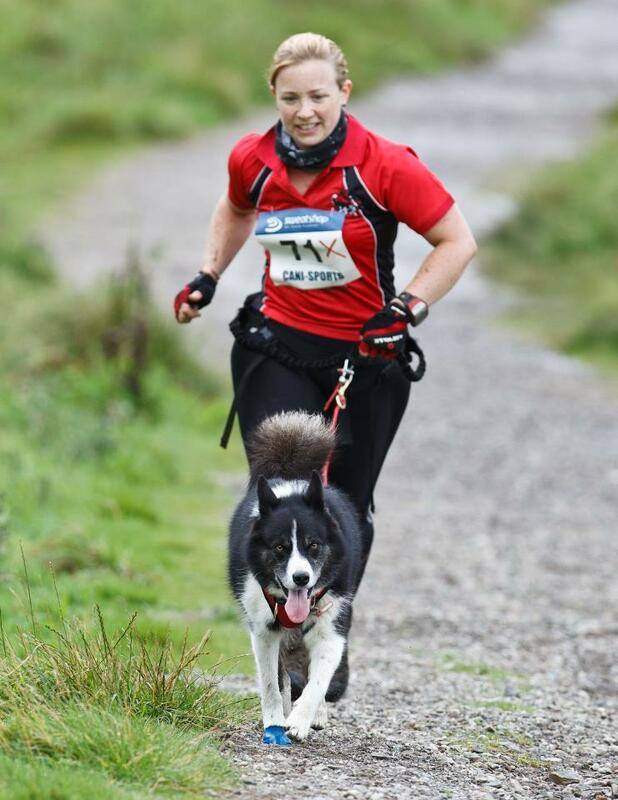 If you make sure you end your run with your dog wanting more then you know your dog is enjoying the running and they will often be more keen if they know they are only covering a shorter distance. Of course there is another option and that is to embrace the dawdling! By allowing yourself to set pace with your dog you will still get to where you’re going, just a bit slower and you may even enjoy the extra things you notice around you because you’re not so focused on rushing along to the next thing. In a society where we’re all rushed off our feet all the time, it’s sometimes nice to just appreciate that you’re out with your dog enjoying something together and I for one will try to remember that the next time my ‘dawdler’ is smiling up at me as she stops for the 10th time in as many minutes.